Place pipelines along pre-existing roads and rights-of-ways whenever possible. Place well pads near pre-existing roads. 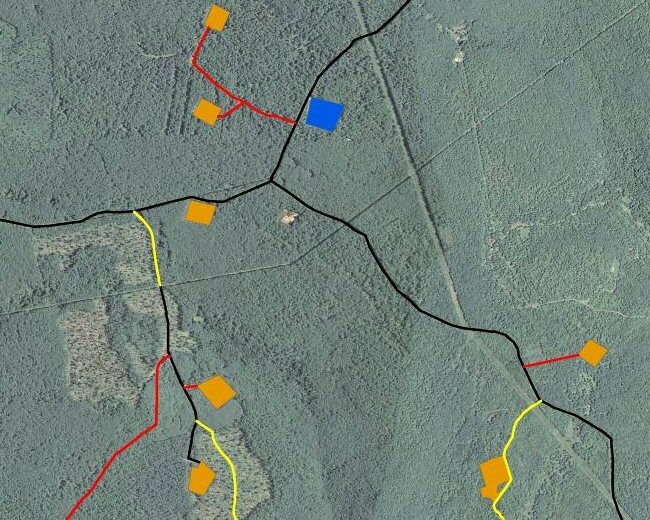 Avoid pads and pipelines within core forest habitat (areas farther than 300 ft from any other road or opening). Encourage gas companies to share gathering lines, water lines, etc., when working in the same area. Revegetate pads and pipelines with shrubs and trees and minimize the time these areas are left unrestored. Use woody debris from pad clearing to create brush piles and windrows that form corridors of microhabitat for amphibians, reptiles, and small mammals. Birds will also use these as places to perch. Their droppings and the seeds they contain will help to replant the next forest. Identify and avoid disturbance within sensitive habitats such as spring seeps and vernal ponds.